For three years, the Grall Family has hosted a lemonade stand. The first year they raised $100, the second year they raised between $100 and $300, and at the lemonade stand of 2016 they raised over $10,000. Zoe Grall is Jay and Brooke Grall’s eight year old daughter who is a second grader at Lovejoy Elementary. When Brooke was 16 weeks pregnant, Zoe was diagnosed with spina bifida and hydrocephalus. She also has Chiari. When Zoe was born, she needed immediate back surgery and five days later she needed to have a shunt inserted. She has had numerous surgeries since birth. Zoe relies on her wheelchair for mobility. Since Equest has moved, that form of therapy is no longer an option and Zoe has taken to swimming. She said, “I wish the world was made of swimming pools because we’d all be the same.” While in the water, Zoe’s confidence rises and she feels very independent. Her daily life, because she is in a wheelchair, doesn’t allow her to be as active as other children. Swimming allows her to be active. 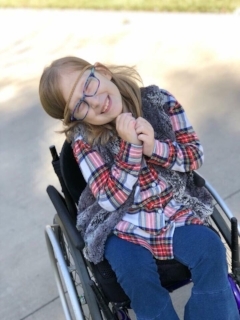 In addition to paying for swim therapy, the Grall’s have home modifications they would like to make for Zoe such as smoothing out door thresholds and changing the light switches. They also believe she will want a sports wheelchair sometime in the future, because Zoe wants to play sports. Brooke said, “We didn’t plan on our child having spina bifida. We didn’t plan on finding amazing therapies.” They want Zoe to have a high functioning life and that means going beyond what insurance covers. Zoe’s favorite things about the lemonade stand are the strawberry lemonade and seeing friends. She said, “My goal is to raise money.” She would like to give some of the funds raised to her church and to a charity yet to be determined. Brooke has been a teacher with Lovejoy ISD for eight years and is currently the music teacher at Sloan Creek Intermediate. They moved to Lucas in July of 2017 to be closer to Brooke’s work and to live closer to many of their closest friends. They chose their home because it had space for Brooke’s mother to live with them, it was all one level and it had wide doorways. The ‘When Life Gives You Lemons’ lemonade stand will be held on April 14 from 11:00 a.m. – 2:00 p.m. at the Grall’s home located at 1104 Greenacres Ln., Lucas 75002. If you would like more information, or to donate, please contact Brooke at jbrookegrall@gmail.com.